We have all seen the heartbreaking photos of Syrian refugees in recent years, and Jennifer Seynab Joukhadar, offers an entryway into that experience through the breathtaking story of a family forced to flee violence in their homeland. Joukhadar, who is Syrian American, in her debut novel The Map of Salt and Stars, personalizes in compelling and lyrical prose a country and a struggle that to many readers exists only in news headlines. Similar to how The Kite Runner illuminated life in modern-day Afghanistan at a time when misconceptions were rife, Joukhadar's work shines a light on the past and present of a country in turmoil, and the inspiring resilience of the innocent people who have been devastated by conflicts. Joukhadar is a Syrian American author, originally from New York City, born to a Muslim father and Christian mother. She is a member of the Radius of Arab American Writers (RAWI) and of American Mensa, and received her Ph.D. from Brown University. Her short stories have appeared or are forthcoming in many publications, including The Paris Review, The Kenyon Review, The Saturday Evening Post, and PANK Magazine. 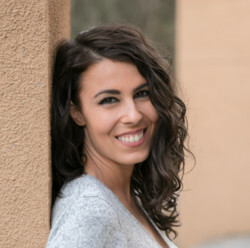 She is a 2017-2020 Montalvo Arts Center Lucas Artists Program Literary Arts Fellow and an alum of the Voices of Our Nations Arts Foundation (VONA) and the Tin House Writers' Workshop. Her work has been nominated for a Pushcart Prize and the Best of the Net. For more information on this remarkable writer, visit www.JenniferJoukhadar.com. 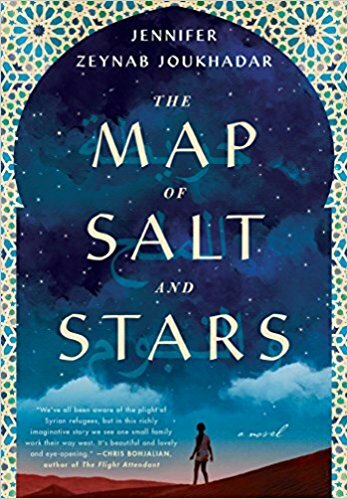 The Map of Salt and Stars is set in the summer of 2011, and Nour (as Joukhadar is also known) has just lost her father to cancer. Her mother, a cartographer born in Syria, decides to move Nour and her sisters from New York City back to her home country in order to be closer to their family and their heritage. It didn't take long for Nour's mother to see that the Syria she knew is changing, and it isn't long before protests and violence change their quiet neighborhood. When a shell destroys their house, the family is forced to flee to safety. Their journey takes them across seven countries in the Middle East and North Africa, and they are exposed to unfathomable dangers as they search for a place to take them in and a way to feel at peace again. Nour, adrift and afraid, clings to a story her beloved baba used to tell her. More than eight hundred years earlier, Rawiya, daughter of a poverty-stricken widow, leaves home disguised as a boy named Rami in order to make her fortune. Joukhadar writes, "Everybody knows the story of Rawiya. They just don't know they know it. "Once there was and was not a poor widow's daughter named Rawiya whose family was slowly starving. Rawiya's village, Benzu, lay by the sea in Ceuta - a city in modern-day Spain, a tiny district on an African peninsula that sticks into the straight of Gibraltar. "Rawiya dreamed of seeing the world, but she and her mother could barely afford couscous, even with the money Rawiya's brother, Salim, brought home from his sea voyages. Rawiya tries to be content with her embroidery and her quiet life with her mother, but she was restless. She loved to ride up and down the hills and through the olive grove atop her beloved horse, Bauza, and dream of adventures. She wanted to go out and seek her fortune, to save her mother from a life of eating barley-flour porridge in their plaster house under the stony face of Jebel Musa, watching the shore for her brother's ship. "When she finally decided to leave home at sixteen, all Rawiya had to take with her was her sling. Her father had made it for her when she was a little girl throwing rocks at dragonflies, and she wouldn't leave it behind. she packed it in her leather bag and saddled Bauza by the fig tree next to her mother's house. "But Rawiya's mother frowned and asked her to promise to be careful. The wind came strong off the strait that day, rattling through her mother's scarf and the hem of her skirt. "Rawiya had wrapped a red cloth around her face and neck, hiding her new-cut hair. She told her mother, 'I won't stay any longer than I have to.' She didn't want her mother to know she was thinking of the story she'd heard many times - the story of the legendary mapmaker who came to the market in Fes once a year. "The wind opened and closed Rawiya's scarf like a lung. The painful thought stuck her that she did not know how long she would be gone. "Rawiya hugged her mother fiercely and told her she loved her, trying to commit her smell to memory. Then she climbed into Bauza's saddle, and he clicked his teeth against his bit. "'But none more so than home.' Rawiya meant this more than anything else she'd said. And then Rawiya of Benzu nudged her horse until he turned toward the inland road, pas the high peaks and fertile plains of the mountainous Rif where the Berbers lived, toward the Atlas Mountains and the teeming markets of Fes beckoning from the south. "The trade road wound through limestone hills and green plains of barley and almond trees. For ten days, Rawiya and Bauza picked their way along the winding road ground flat by travelers' shoes. Rawiya reminded herself of her plan: to find the legendary mapmaker, Abu Abd Allah Muhammad al-Idrisi. She planned to become his apprentice, pretending to be a merchant's son, and make her fortune. She would give a fake name - Rami, meaning 'the one who throws the arrow.' A good, strong name, she told herself." Rawiya then embarks on an epic journey across the Middle East and North Africa, and it's a journey that will lead her across seven seas and deserts, to magnificent palaces and abandoned cities, and into battle with mythical beasts and those who would use their precious maps for their own ends. Traveling identical paths several centuries apart, Nour and Rawia must learn that, sometimes, you have to draw your own map to find your way home. A modern masterpiece, The Map of Salt and Stars is one of the most enlightening and informative books you will read all summer. A lovely review. I'm intrigued. I am crazy about this blog.This is one wonderful blog article. I have received a bunch of information. I really appreciate to meet to it and i emphasize to this blog. I don't know what to say except that I have enjoyed reading.Bookmarked this site. You absolutely have wonderful stories.I recently found many useful information in your website especially this blog page. Your articles are useful for me.I can understand them easily.I can solve difficulties by apply them.Can you continue uploading them frequently? I wait for them and always support you.